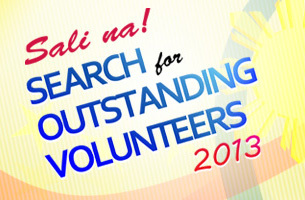 The 2013 SEARCH FOR OUTSTANDING VOLUNTEERS (SOV) is now open for nominations. All individuals of Filipino citizenship and Filipino volunteer organizations, and local chapters of foreign volunteer organizations that currently provide volunteer assistance in the Philippines are eligible to participate. The SOV recognizes the exemplary performance and dedication of Filipino volunteers, as they build strong communities across the country. Since 2001, the Search had given honor and recognition to 101 volunteers and volunteer organizations. They initiated and/or assisted development projects in different sectors nationwide. They serve as models whose contributions to society are considered best practices in volunteerism. The Award categories are (1) National Outstanding Volunteer Award (NOVA) for outstanding volunteer individuals and organizations, including corporate volunteering initiatives and (2) Volunteer Lifetime Achievement Award (VLAA) for those who had engaged in consistent volunteering activities for at least twenty-five (25) years and attained national status and recognition in the field of volunteerism. Individual/s and organization/s with special contribution to volunteerism and has made a difference in the history of Philippine volunteering are also recognized through Special Citations. Nominations from the National Capital Region (NCR) must be submitted to the Philippine National Volunteer Service Coordinating Agency (PNVSCA), those from the regions to the National Economic and Development Authority (NEDA) Regional Offices and those from the Autonomous Region in Muslim Mindanao (ARMM) to the Regional Planning and Development Office (RPDO). The deadline for submission of nominations is on 23 August 2013. Nomination forms are available at PNVSCA, NEDA Regional Offices and the ARMM-RPDO and can be downloaded at their websites.